Our vegetable waxes are available in three standard sizes. 5 Gallon Pail with handle. as it is semi solid at room temperature. Low viscosity oil based coating for vegetables, stone fruits, etc. Medium viscosity oil based coating for vegetables, stone fruits, etc. High viscosity oil based coating for vegetables, stone fruits, etc. Extra high viscosity oil based coating for vegetables, stone fruits, etc. Concentrated mild cleaner for produce, pH neutral. One gallon makes 300 when used for defuzzing peaches. Sodium Hypochlorite chlorine source. EPA Reg No. 43410-69-83103. Labeled to meet US EPA requirements when chlorine concentration is contact with fresh produce needs to exceed 25 ppm. Calcium Hypochlorite chlorine source. Labeled to meet US EPA requirements whenChlorine concentration in contact with fresh produce needs to exceed 25 ppm. Tablets are 68% Calcium hypochlorite. Approximately 1.25 pounds of tablets will replace one gallon of HDH Clor. Tablets require system for dissolving before use. Neutralizer for clhorine in water and wastewater. One gallon of Neutra Clor will neutralize the chlorine in approximately 1800 gallons of wastewater at 100ppm chlorine. The phosphoric acids are recommended for systems based upon HDH Clor, but all acids are compatible. Phosphoric acid not only adjusts the pH, but also functions as a corrosive inhibitor. Citric Acid is an excellent material for pH control but at 30% strength, it only has about 60% of the neutralizing power of 24% Phosphoric Acid. Citric acid has no corrosive inhibiting properties. Hydrochloric acid will adjust pH adequately, but the fumes from the concentrate will corrode all common metals except stainless steel. The fume are also hazardous to personnel. Hydrogen Peroxide based fungicide - batericide. EPA Registered (83103-1) for postharvest packinghouse application, greenhouse sanitation, turf applications (including gulf courses), potato storage applications, etc. Calcium Chloride solution. Reduces bitter pit of apples. When used in conjunction with Chloride and Agri-Wet T on vegetables, helps heal wounds and increase decay control efficacy. Silicone based lubricant for process line use. When applied to shears, sizers, conveyor rolls, etc., will reduce wax build up on equipment surfaces. Specially formulated cleaner for removing wax build-up on processing equipment. 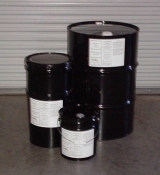 Rust remover and under coat for ferrous metal surfaces. Natural wax based emulsion used as a waterproof spreader sticker for compatible inseticides and fungicides. Blocks UV rays and when used with Surround™ WP (Englhard) it offers protection from sunscald and insects in pome fruit.